Basic displacement information provided by the service is the satellite line-of-sight (LOS), with projected to ground geometry and quality measures per measurement point, in radar geometry. East-West and Up-Down deformation rates produced by combining data stemming from ascending and descending orbits. Basic displacement information data should be seen as an intermediate product, necessary in order to produce East-West and Up- Down deformation rates. These two LOS vector components from basic displacement can be used to calculate the east-west and vertical components of movement. East-West and Up-Down deformation products are useful for general engineers who will find them easier to interpret than LOS measurements. They will also be very useful for highlighting horizontal deformation. Sentinel-1, carried out by the European Space Agency Copernicus Programme, is a space mission designed as a two-satellite constellation. This means that two satellites, Sentinel-1A and Sentinel-1B, share the same orbit - but 180 degrees apart. While one satellite can orbit the Earth in 12 days, both satellites operating together provide a 6-day repeat cycle. Areas around the equator see the satellite repeat in just three days, Europe and Canada in less than three days, and Arctic areas in less than one day. A point cloud is a set of data points in an area of measurement. Point density describes the number of points in an area of measurement. Therefore, the higher the point cloud density, the more data or information is available in the measured area. Higher point density means you will get a more detailed image because there is more information available. LiDAR requires an aircraft flight making it a costly option and weather dependent. SAR technology is acquired through an orbiting satellite that is more cost effective and can penetrate through cloud coverage. Both are able to acquire images during day or night. LiDAR provides very high-resolution data allowing detection of forest density or minor construction flaws. SAR observes the progression of surface deformation by utilizing multiple data sets of the same area over time. SAR and GPS can often work in tandem, complementing an overall effort to keep public and private infrastructure closely monitored and stable. While GPS can produce daily analysis of an specified area, SAR is able to give comparisons of historic and current data to offer displacement data over time. This can serve as necessary information when deciding to utilize more costly measurement options. SAR relies on orbiting satellites that are able to observe deformation without needing a ground receiver. GPS relies on ground receivers to transmit information. SAR collects detailed information of a large area at one time. GPS is not able to collect dense large-scale data quickly. SAR provides the relative amount of deformation. GPS measures the absolute amount of deformation. Initially, SAR requires analysis of at least 20 images to conclude deformation information. Following initial analysis, one-on-one images can be used. Images are taken of the same location at different times. 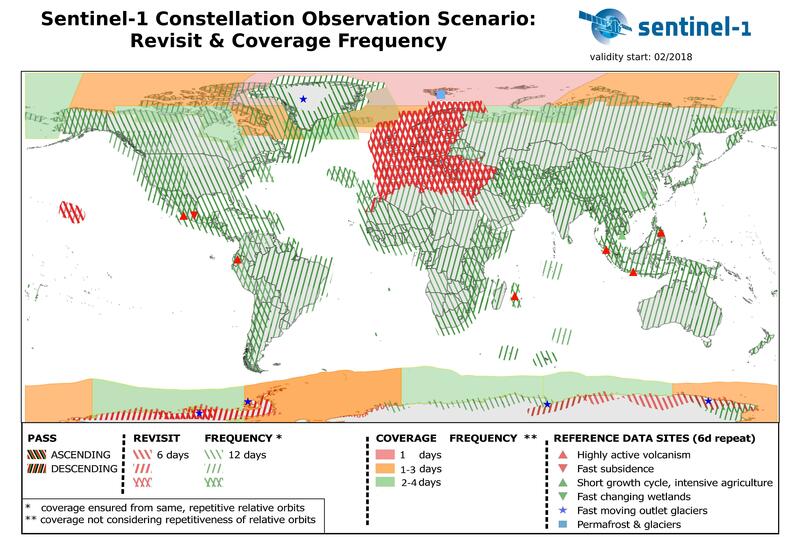 Because of SAR's satellite orbits, locations cannot be observed 24 hours using SAR, but every 12 days. GPS is able to continuously monitor an area because of multiple satellites acquiring data. SAR measures the distance from the satellite to a target on the ground and back to the satellite by sending out one assessment beam and measuring its distance. GPS monitors the distance from a satellite to ground receiver. SAR measures ground deformation in the line-of-sight (LOS) direction that requires two images of the same area on the ground at different times. GPS is able to observe 3-dimentional deformation because of multiple satellites acquiring data from different directions at the same time. SAR satellites orbit the earth about every six days, allowing some areas of the earth more frequent coverage, some less. SAR acquires data when it is above a target area, and requires two images to conclude information, allowing for high-density observation data about every two weeks. GPS is possible 24 hours because it does not rely on specific satellite rotations. SAR can be used to monitor objects that have good reflection. Usually these are buildings, railroads, bridges, bare land, rocks, docks, piers, dams and other human built objects. Bare slopes can be also monitored for falling rocks and landslides, as well as landslides. The ideal objects to monitor using SAR include a rough surface, like concrete, rock, or metal, and have many corners, which reflect very well. However, objects made from wood or other non-reflective surfaces, long suspension bridges and other small objects are not ideal for SAR to monitor. Interferometric synthetic aperture radar (InSAR) is a space-borne (or, alternatively, airborne) microwave imaging system that can be used to generate maps of ground deformation. Ground deformation is the movement of the Earth’s surface caused by seismic strain, landslides, and mining or landfill activities. SAR can provide a historical analysis of ground movement that can be used for infrastructure monitoring. Acquiring frequent (bi-monthly) infrastructure displacement measurements can serve as an early warning system for possible infrastructure malfunction or failure. This allows prioritization of vehicle- and person-based inspections, thus reducing cost and increasing efficiency of maintenance planning. Synthetic aperture radar is a method of observation utilizing satellites and surface deformation monitoring technology.